These awards are special recognition for those outstanding snowmobilers and/or clubs who are deeply committed to organized snowmobiling and are involved in snowmobile organizations that strive to make the sport even more enjoyable in the future. The intent of the Awards program is to recognize the outstanding contributions made to the sport of snowmobiling in Vermont. The following awards may be presented annually to volunteers or deserving individuals. *Please use separate forms for each award nomination. Nominations must be filed with the recognition committee no later than April 1 or as indicated under criteria for award. Nomination applications must include supporting data for all activities including pictures, news clippings, video or other supporting information. Nomination applications must include written narrative as to why the club (person) that is being nominated is deserving of the award. The names of association winners are to be forwarded to NEISC for consideration. This award is given to the individual who has demonstrated their commitment to the sport, a true volunteer, unselfishly giving of oneself, above and beyond. Individuals who are involved in snowmobile organizations striving to make the sport even more enjoyable in the future. Nominations for this award must be received by the VAST office no later than April 1. The winner’s nomination application will be forwarded to the American Council of Snowmobile Associations (ACSA) for consideration for U.S. Snowmobiler of the Year. This award is given to the family who has demonstrated their commitment to the sport, true volunteers, above and beyond. Individuals who are involved in snowmobile organizations and striving to make the sport even more enjoyable in the future are eligible, nominations for this award must be received by the VAST office no later than April 1. The winner’s nomination application will be forwarded to the American Council of Snowmobile Associations (ACSA) for consideration for U.S. Snowmobile Family of the Year. This award is given to the individual based on promotion of the sport to both snowmobilers and non-snowmobilers, promotion of club membership, leadership positions held in a club or state snowmobile association, participation in fund-raising or charity events, involvement in trail-grooming operations, and any special projects nominee may be working on, nominations for this award must be received by the VAST office no later than April 1. The winner’s nomination application will be forwarded to N.E. Chapter International Snowmobile Council for consideration as the N.E. ISC Chapter Dealer of the Year. This award is given to a club that demonstrated commitment to the advancement and betterment of snowmobiling in club area. Shown through trail construction and development, community involvement and charitable activities. This award is given to a club or individual that demonstrated commitment to the advancement and betterment of snowmobiling in club area. Shown through trail construction and development, community involvement and charitable activities. This award is given to the individual who has demonstrated their commitment to the sport, a true volunteer, unselfishly giving of oneself, above and beyond. Demonstrates initiative and leadership in club activities. Willingness and desire to help the club in such activities as trail maintenance and construction and charitable events. Must be 15 years old or younger. This award is given to an individual who has recently become an active volunteer showing exemplary dedication above and beyond expectations. The recipient(s) may be new to snowmobiling, or someone who has been riding for years but has now stepped up and assumed a leadership role in volunteerism. There may be multiple recipients if several individuals meet these criteria. This award is to recognize those individuals who have actively served their club(s), county and VAST for 25 years or more. It celebrates all long term volunteers, not only those involved in trail work, but in all aspects of organized snowmobiling such as club, county and VAST officers. Self-nominations, Committee nominations, and/or nominations by the snowmobiling public may be made at any time during the year. Recipients will receive a framed certificate of commendation signed by the VAST Executive Director and VAST President, a name badge signifying them as a Trailblazer and acknowledgement in the Snowmobile Vermont Magazine. This award is selected from all Trailblazer nominations and is awarded at the Annual Meeting. The recipient’s name will appear on a plaque at the VAST office in recognition as a Founder – VAST’s number one volunteers. Annual Awards to be presented by a blue ribbon committee comprised of the Recognition Committee, Trails Administrator, President and/or Chair of the Trails Committee. Candidates for these Awards are nominated by the Membership. This award is given to an individual or individuals who have demonstrated their commitment of the sport by promoting the development of and grooming of snowmobile trails. The ideal candidate has unselfishly given of him or herself above and beyond and has striven to make snowmobiling even more enjoyable bow and in the future. This Award is given to a deserving club based upon construction, signing (safety and directional), and grooming. This Award is based upon signage that meets all of the criteria established in the VAST Signing Manual. This Award is based upon grooming that meets or exceeds the criteria established by the VAST Trails Committee and/or the VAST Trails Administrator. The following awards may be presented annually to VAST staff, volunteers or deserving individuals. Lead or actively participate on VAST committees charged with issue resolution, policy development, or development of long-range plans. Exhibits leadership in creating county and VAST unity. Given for significant monetary or non-monetary contributions to VAST, county or local clubs or VAST supported charities. Organize or contribute to media coverage favorable to snowmobiling locally and nationally. Makes significant contributions (monetary, in kind or other) to improve the quality of Vermont snowmobiling. May be presented to an individual who has served VAST admirably on a continuing basis. May be presented to an outgoing Director or Officer after a minimum of one year’s service. Significant contributions to local and county trail systems and club operations. Significant efforts benefiting local club or county. Outstanding examples of cooperation between agencies and organizations that benefit Vermont snowmobiling. Significant assistance from landowners to acquire permission for or adjust land management activities to accommodate snowmobile trails. Donation of easements for snowmobile trails. Outstanding efforts to promote safe, responsible and legal snowmobile operation. Active political or legislative lobbying in support of the sport of snowmobiling in Vermont and nationally. Judged by board of directors according to by-laws. Given to an individual whose service and enthusiasm for VAST and the sport of snowmobiling exemplify the best characteristics of volunteerism and leadership above and beyond the call of duty. This is an open award, and may be presented to anyone in the snowmobiling community, regardless of age ot level of service, who displays the above qualities. This award may be given to the Vermont State Legislator who has worked the hardest to advance the sport of snowmobiling in Vermont. The award shall be based on the legislator’s support for legislation or for work that advances and enhances the Statewide Snowmobile Trails System. It may also be given for their overall support for the sport of snowmobiling as well as their commitment for the advancement of snowmobiling in Vermont. The award may be given to the Vermont Public Official who has worked the hardest to advance the sport of snowmobiling in Vermont. The award shall be based on the official’s support for legislation or for work that advances and enhances the Statewide Snowmobile Trails System. It may also be given for their overall support for the sport of snowmobiling as well as their commitment for the advancement of snowmobiling in Vermont. The award may be given to an individual or to a snowmobile club that has demonstrated that they have gone the extra mile for the sport of snowmobiling. The recipient must have shown that they have worked tirelessly for the advancement and betterment of the sport of snowmobiling in Vermont and they have demonstrated that they have overcome great adversity to assure that all Vermont snowmobilers have an integrated and connected snowmobile trail system on which to ride. Nominations for this award must be given to the Executive Director prior to June 1 of the fiscal year. The Executive Director shall forward all recommendations to the Board of Directors and the Board must unanimously approve the Honorary Membership(s). The award may be given to a deserving non-VAST member. Legislators and public officials will qualify for this award. The recipient must have shown that they have worked for the advancement and betterment of the sport of snowmobiling in Vermont. Honorary members shall not be entitled to any voting privileges and they will not receive Association correspondence. Nominations for this award must be given to the Executive Director prior to May 1 of the fiscal year. 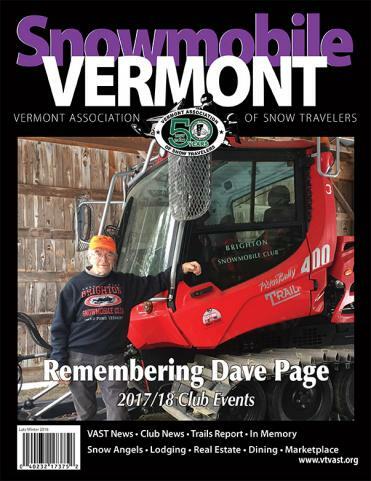 The Executive Director shall forward all recommendations to the Board of Directors and the Board must approve the “Partnership Award.” The award shall be given to recognize an individual, landowner, group, town or other organization that consistently encourages and advocates for snowmobiling in Vermont. All nominations shall be supported by documentation of the recipient’s commitment to snowmobiling. The award shall be an engraved plaque and shall be presented at an appropriate event in the recipient’s community. This award is given to an individual who has demonstrated their commitment to the sport at the club level by a positive leadership role in the development and maintenance of club trails. This award is given to an individual who has demonstrated their commitment to the sport at the county level by a positive leadership role in the development and maintenance of their county-wide trail system.